A repeat of the Florida debacle in the 2000 presidential election is the fear of every election administrator. Despite the relatively complication-free 2008 election, we are working with fairly new federal legislation designed to ease election administration problems. The implementation of the Help America Vote Act of 2002 (HAVA) raises the question, how effective have reforms been? Could another Florida happen? Helping America Vote is focused on the conflict between values of access and integrity in U.S. election administration. Kropf and Kimball examine both what was included in HAVA and what was not. Widespread agreement that voting equipment was a problem made technology the centerpiece of the legislation, and it has remedied a number of pressing concerns. But there is still reason to be concerned about key aspects of electronic voting, ballot design, and the politics of partisan administrators. It takes a legitimacy crisis for serious election reforms to happen at the federal level, and seemingly, the crisis has passed. However, the risk is still very much present for the electoral process to fail. What are the implications for democracy when we attempt reform? 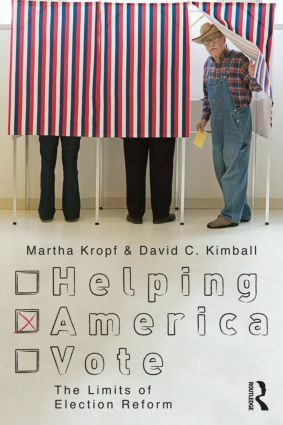 "Helping America Vote is an excellent entry for the Controversies series. The authors’ emphasis on ‘the change you make depends on how you perceive the problem’ is a very good one; it not only gives a focus to the book, but by itself it will be a lesson to students who read it." "This is an impressive work—a valuable summary and evaluation of election reform efforts following the 2000 Presidential election, covering costs as well as intended benefits. While reporting original research, the authors have produced an accessible document that will be of use to policy makers and administrators as well as to researchers and students." 1. Introduction: The Context of Election Reform 2. How Does Definition of the Problem Affect the Solution? 3. Did the Reforms Increase Accuracy? 4. At What Cost? The Unintended Consequences of Reform 5. We Mostly Eliminated the Butterfly Ballot…Isn’t That Enough? 6. Defining the Problem in Human Terms: Who Implements Reform? 7. What Have Reforms Accomplished? Martha Kropf is Associate Professor of Political Science at the University of North Carolina–Charlotte. David C. Kimball is Associate Professor of Political Science at the University of Missouri–St. Louis.